This is the current project. The fabric for Turquoise Falls was purchased on a trip we went on several years ago to upstate New York. We stayed in a hotel across from a Joann Fabrics. We were in Rochester and traveled to Buffalo and to Niagara Falls. The charm & fat quarter pack came in under $15. 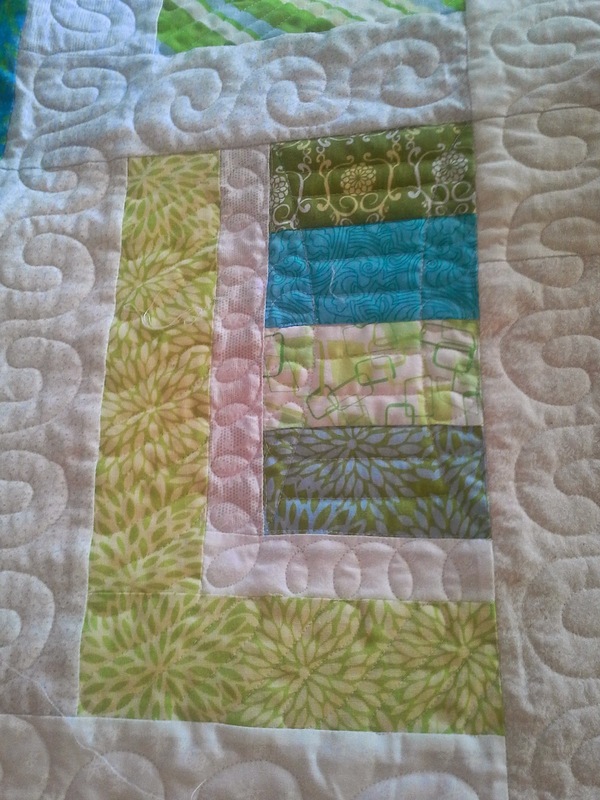 Here is the quilt pattern that is going in the quilt blocks. The color is off. The flower print is a beautiful celery green. It is coming along nicely. It has been awhile since the last finish. It feels pretty good. Our family enjoys putting puzzles together. These fish were found in the basement still sealed. I am not sure how that happened. We have several "under the sea" puzzles. Many are "glitter or glow". Young girls love to do these. Lola and MJJR think this one is too easy. Had it been started in the morning it would be done in one day. Every summer we pull out a puzzle. We keep one going all summer. It helps keep them away from the television. Here is the first finish of the summer. 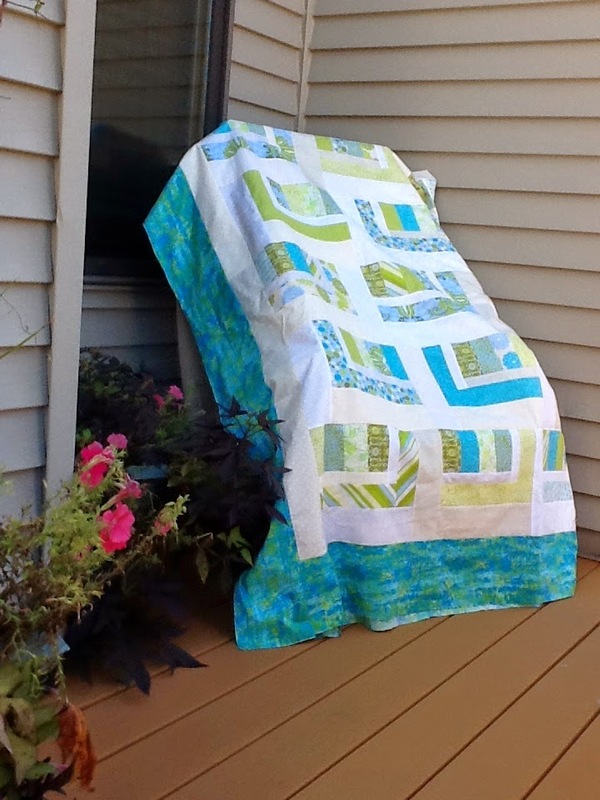 Our guild has what they call a "Quilt Getaway" once a month. We take over a local historical building for the weekend. The building gets used and we get free space to sew. It is rather nice. Laundry dishes and yard work aren't calling, so you make progress. Here is my progress on the most recent project, a twist on Bonnie Hunter's Rick Rack Nines. You can see Monday when the picture was taken was a beautiful day. Today...a little dreary. I managed to sneak away from reality for about 4-5 hours on Sunday. What reality did I leave behind...a broken water softner (after 2 days with no softner and our showers will be orange, we had a whole weekend), a new car that needed some paint touch ups. It was finally ready and picked up Tuesday, more than a week later. The 10 yr. old SUV returned to the shop, back in after the engine light came on 2 hours after we picked it up. We finally are no longer shuffling to get everyone where they need to be. We had a car whose engine light was on for a couple years, but this time the error says that the engine is misfiring and the car will blow up. They just put a new harmonic balance on so it probably is the old engine not playing nicely with the new part. We also had to tear apart the air conditioner due to all the cottonwood fuzz from the neighbors trees clogging the unit, the unit is only 8 months old. So after Sunday, the air conditioner is good. The hot water tank and water softener are new. The new vehicle is in our possession. We have enough vehicles to maneuver ourselves around now. DH has no cavities. My task for today--take MJJR to find a swimsuit (just what every 15 yr. old tomboy wants to do--or every female above the age of 10). Having my quilt mojo back, many of the UFO's are being worked on so stop back in and check out the quilting progress of Turquoise Falls. I have been working on a scrap project for the last couple weeks. 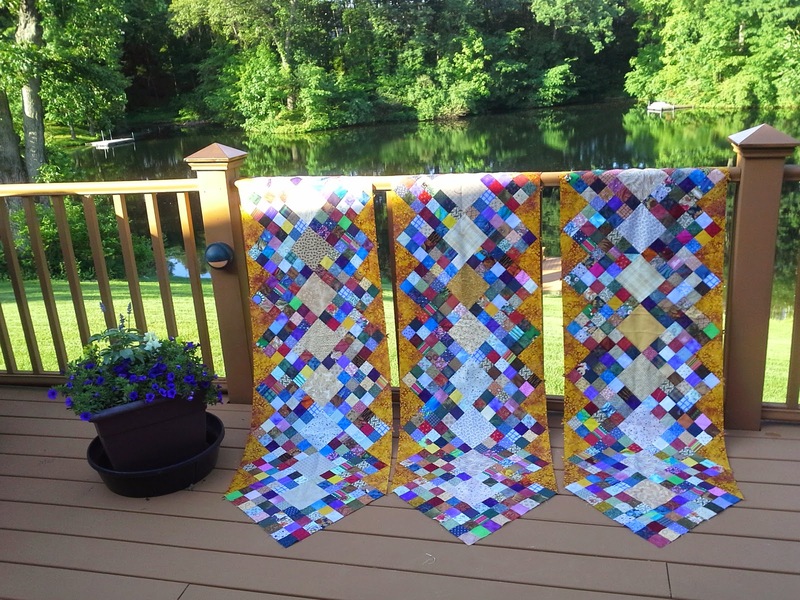 The pattern starts as Bonnie Hunter's Rick Rack Nine's. I decided to make the rows and finished the nine patches to a point. Instead of having the rows interact mine will stand alone with lots of side set-in triangles. 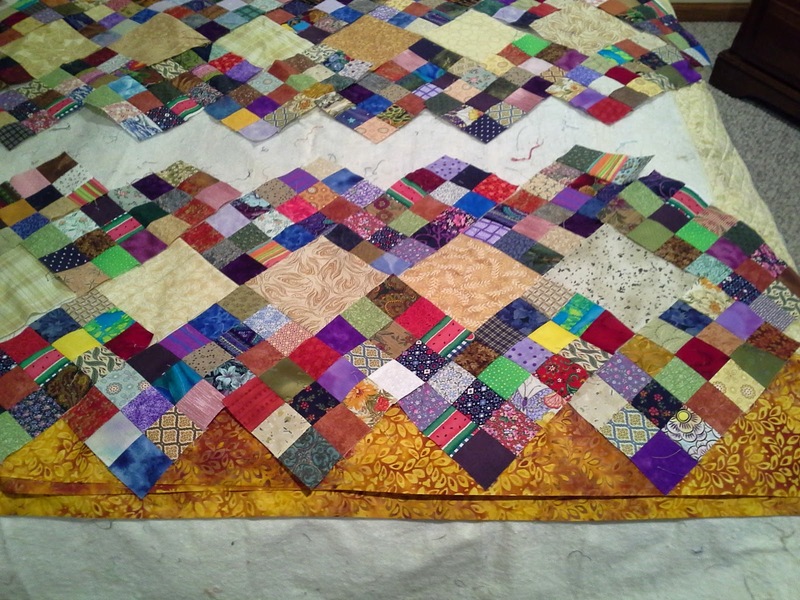 The "cheddar" batik will be the set-in triangles, if there is enough fabric. We were recently given a "cheddar" challenge and this will fit. Some strip will fit between the rows. I will be asking for advice when the time comes. Only 12 more nine patches to go. Check out other Design Walls. Judy L. has the list.